RE/Advantage recently developed a new website for REO specialist, John Baughman, in Palm Beach County Florida. John has been in the Real Estate business for 10 years now. He belongs to the Regional MLS in Folrida primarily selling homes that have been foreclosed in St. Lucie, Martin, Palm Beach, Broward and the Miami Dade areas. John currently has 56 active listings and has closed over 50 listings since January 1, 2010! 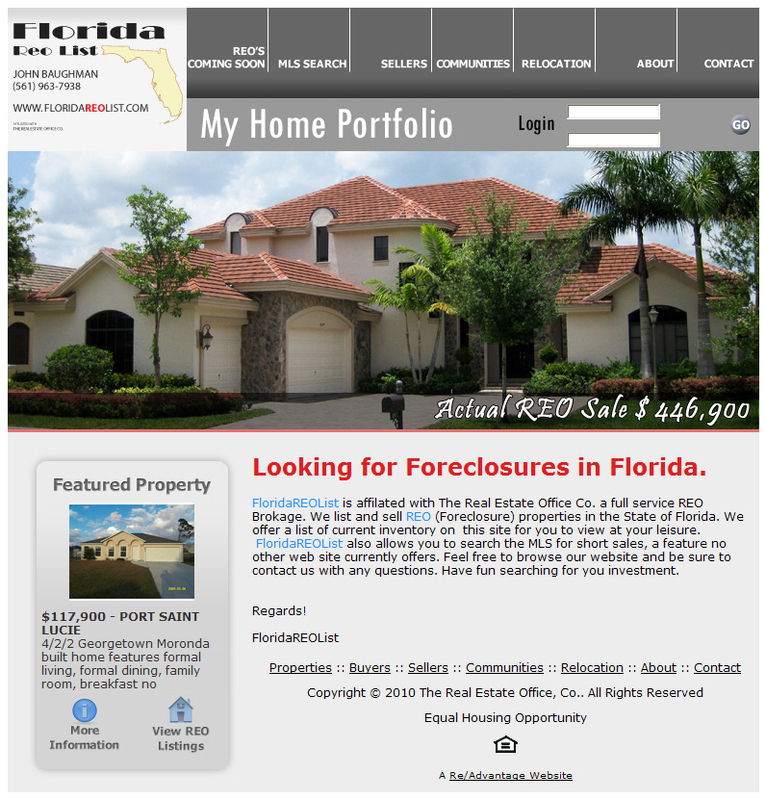 When potential clients contact John about his REO services he is now able to direct them to his website for more information on foreclosed properties in the area. When asked how his website has increased his lead generation he replied, “Yes, it has allowed me to expose my foreclosure listings without limitations!” John also mentioned, now that he is marketing his REO list properly that he has seen an increase in sales because of the exposure he currently has with his website and IDX solution. John also uses newspaper ads as well as the South Florida Homes Guide to market his listings. Past clients of John Baughman were able to search for listings with the integrated, IDX 3.0, listing search tool that is integrated into his site and then receive updated auto listing updates when a new property was submitted to the RMLS that matched their search results. John hopes to continually growing his REO database and streamlining the purchase process by offering more detailed information and ability to present offers online. Looking to find a warm escape from the winter weather, check out all the professional Real Estate services John Baughman has to offer!